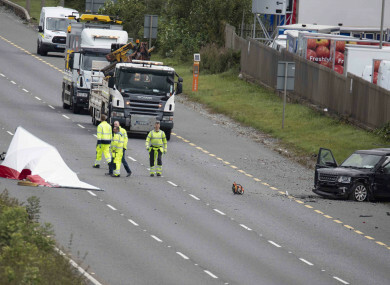 A MAN HAS died after a single vehicle crash on the Naas road. Gardaí had closed the road past junction 2 at Kingswood following what they called a “serious collision”. They have now confirmed that a man in his 20s was fatally injured when the 4x4 vehicle he was driving and sole occupant of crashed into the barrier. He was taken to Tallaght Hospital where he was pronounced dead. Gardaí are appealing for witnesses to contact Clondalkin Garda Station on 01 6667600, The Garda Confidential Telephone Line 1800 666 111 or any Garda station. Email “Man killed after 4x4 hits barrier on Naas Road”. Feedback on “Man killed after 4x4 hits barrier on Naas Road”.